Perfectly Located just a couple of minutes easy stroll to the beach. Fresh, modern, open plan & free standing (no common walls) property with 3 bedrooms & sparkling swimming pool. Sleeps up to 6 adults. Third bedroom with single bed (plus roll out trundle bed for that extra person), port a cot also available. Just perfect for that beachside getaway with family or friends. Many features including high raked ceilings, polished brushbox floors throughout, modern kitchen & sparkling modern 3-way bathroom with large separate shower and a deep bath. 2 balconies -one off the main bedroom overlooking the pool and one off the living area offering lovely open leafy district views over the "Avoca bowl" area. Perfect to just sit back & watch the sunset over the hills. Leafy, landscaped surrounds with outdoor setting & securely fenced pool. Located at the rear of a unique complex of only 3 free-standing townhouses- so lots of privacy and no common walls. Generous undercover parking- possible for 2 small/medium cars. Check our location at 24 Avoca Dr, Avoca Beach. Best value accommodation so close to the beach. Please note - This property is not suitable for groups under the age of 21years. Summer school holidays min 5 night stay. Easter long weekend min 4 night stay. Weekend bookings min 2 nights. This is a smoke free property. Not suitable for pets. For your added security this property ,"the beach hut" is only managed in Australia and we never request payments be made to overseas bank accounts. Avoca Beach is known as one of the safest & cleanest beaches on the Central Coast. Offering a protected rock pool, patrolled surf beach, shady grassed picnic areas and a large lagoon to explore by canoe or paddle boat. Avoca Beach Surf Lifesaving Club is a modern state-of-the art surf club with a great award winning cafe to enjoy a coffee or light meal while taking in the beachfront views. The adjoining secure playground has also been recently upgraded with fabulous new play equipment for the young and exercise equipment for the more mature. Avoca Beach is only a short drive to National Parks & all Central Coast attractions. The townhouse enjoys a premium Avoca location and is only a 80m stroll from the patrolled surf beach. All this only 90mins from Sydney airport and 50mins from Wahroonga on the F3 freeway. Many outdoor activities including- diving, boating & fishing charters. Local art & craft galleries, restaurants & cafes plus the unique local art house cinema. Tennis courts are also available for hire. Short drive to Bouddi National Park and numerous walking trails and lookouts or maybe just a stroll up the beach to Nth Avoca. 10mins to cosmopolition Terrigal with it's many restaurants, boutique shops and live music wine bars or 12mins to Erina Fair Shopping Centre & Hoyts cinema complex. All Central Coast attractions are not far from Avoca Beach. Beachside Markets by the lake every 4th Sun of each month. This property has been on stayz as a holiday rental property for 20 years prior to my husband & myself purchasing it in 2014. We like to maintain it as a home away from home for our guests & as comfortable as being at home. toilet, combination tub/shower, shower, This is a 3 way bathroom. toilet, shower, This is the second bathroom in the laundry area. A short 5 minute stroll to the Avoca Beach cafes & patrolled beach. Nice and clean, plenty of info on the area provided. Portacot with bedding supplied. All bedding and towels provided. 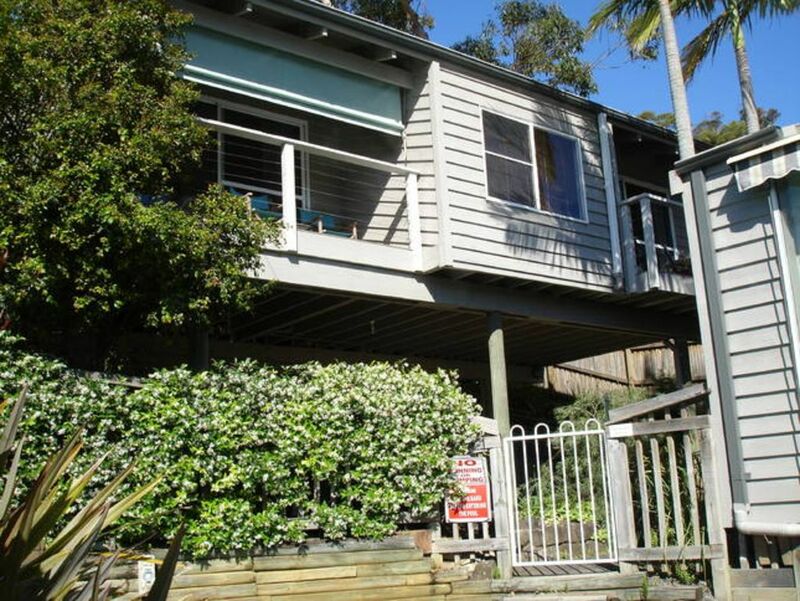 So close to avoca Beach, kids park, rock pool and surf club. Would definitely come back to this house! Great location, great property and communication with Avril made the booking so easy. Our family of 5 was very comfortable and had everything we needed. Everything is within walking distance. Dealing with Avril was easy, and such a lovely touch to leaving chocolates for the kids. We’ll be back! Thank you Robyn, we would love to have you back. We appreciate the way you looked after and respected our place. Everything okay, except the lack of Wi Fi. Fantastic accommodation, home away from home for adults, families or couples! My family of siblings (adults) and Mum enjoyed a very relaxing and comfortable stay at the Beach Hut. It has a welcoming and cosy feeling, is neat and tidy, kitchen fully equipped. The beds, lounge room chairs and couch are very comfortable. You have 2 balconies to enjoy nibbles and drinks in the evening whilst relaxing with a book or listening to music. The washing machine, dryer etc downstairs are an asset.! Good communication from Avril, the surprise upon arrival was appreciated. It is in a great location (you can walk to the beach, shops and restaurants), Every item you might need is provided by the owner. The driveway is a bit steep, it could cause access issues but parking on street is available. We loved our stay and would happily visit again if in the area. Was a lovely house in great location. Was clean, light, bright and airy and kitchen was well equipped. The only thing to note was that the driveway was quite steep so if have big/low car could be a challenge but there is plenty of parking on the street so wasn't an issue. We had a great stay and would visit again.